I had the honor of giving a talk recently at NASA's Goddard Space Flight Center. I was asked to come by the Landsat Team (http://landsat.gsfc.nasa.gov/). Landsat is a satellite that takes pictures of Earth that are used for, amongst other things, environmental and agricultural monitoring. What I was trying to communicate with the talk was the importance of the cultural integration of science, and how visual storytelling is a useful tool for accomplishing that. 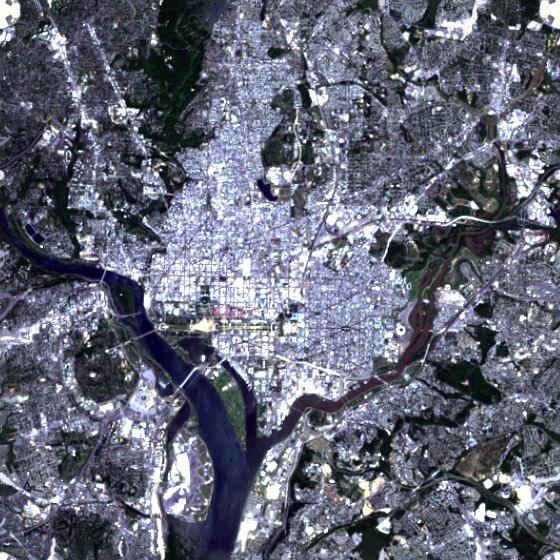 So as the punchline for my presentation I turned Landsat data, an image of Washington DC, into a fabric print, sewed a dress out of it and wore it to the talk.